Sweet basil (Ocimum basilicum L.) is a popular culinary and medicinal herb belonging to the mint family. It is an annual plant reaching up to two feet in height that prefers sunny and warm growing conditions. 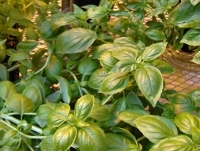 Although it tolerates cool weather, sweet basil does well when it is hot and dry. Sweet basil is native in Central Asia and Northern India, but has been naturalized all over the world. It is an economically important crop in France, India, Egypt, and Israel, and is a minor but valuable crop in the USA. Basil products (dry or fresh herb, essential oil, and leaf extracts) are used as spices and food additives, ornamental plants, and as traditional remedies for various ailments such as headaches, cough, and digestion disorders. The majority of the characteristic flavor- and fragrance-defining compounds are produced in peltate glandular trichomes on the plant’s aerial surfaces. These trichomes are composed of four secretory cells that lie under a waxy cuticle that separates from the cells during trichome development to form an enclosed secretory cavity that looks very much like a bubble over the secretory cells (see image at right). Production of the volatile and non-volatile compounds that are produced by the secretory cells is followed by their secretion into this common subcuticular cavity, where they are stored. The fragrant and other compounds are released when the trichomes are damaged, such as by abrasion. These trichomes can be isolated from the rest of the plant. Intact isolated peltate trichomes retain the machinery needed for their elaborate metabolic activities, and serve as an ideal model system for studying the regulation of processes occurring in a specialized single cell type. We work with four sweet basil accessions that differ by their morphological and chemical phenotypes. Research in our lab has led to the elucidation of cellular mechanisms and metabolic pathways underlying the accumulation of numerous accession-specific fragrance components of sweet basil, such as eugenol, methylchavicol (estragole), and methylcinnamate. More recently, we have extended our studies to non-volatiles such as methoxylated flavones, and are using the extensive accumulated knowledge to improve our understanding of flux partitioning between different metabolic pathways that co-exist in basil trichome secretory cells.